Tenor saxophonist Shafi Hadi was prominent in the new sounds of Jazz in 1962, the year Chico Hamilton recorded Passin' Thru for the Impulse! label. Hadi played with some of the biggest names in Jazz in that era including Charles Mingus and Hank Mobley, even appearing on the soundtrack of John Cassavetes's classic film Shadows! 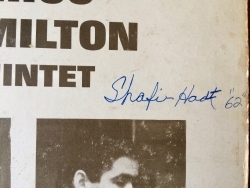 Hadi autographs are a precious thing, and this one on the album cover of Hamilton's Passin' Thru is particularly fitting.